Days after confirming its name and revealing its existence along with a 3.5mm audio jack, OnePlus has finally teased the place where it is set to launch the OnePlus 5T, besides pointing to the smartphone's dimensions. The upcoming smartphone is also being speculated to look identical to the Oppo R11s that was launched last week, and a benchmark listing reveals the presence of an 18:9 aspect ratio featuring display. OnePlus on Sunday tweeted, "Guess which city we're going to party in for the #OnePlus5T launch! [sic]" The tweet also features an image that shows the intersection of West 34th Street and Broadway, located in Manhattan, New York City. All this points to the New York City launch of the new OnePlus smartphone. With the latest attempt to grab some eyeballs in New York City, OnePlus is following in the footsteps of giants like Samsung and Sony that had showcased their top-end offerings in the same city in the past. Moreover, the new launch plan suggests that the Shenzhen-based company might have some announcements specific to its US audience. In another tweet on Friday, OnePlus showed the OnePlus 5 placed on top of the OnePlus 5T. As can be seen in the image, the OnePlus 5T appears to be roughly the same size as the OnePlus 5, indicating the use of a bezel-less 18:9 display that manages to fit a larger screen in much the same form factor. OnePlus is separately speculated to be using a design very similar to the recently unveiled Oppo R11s. Phandroid claims early leaks of the OnePlus 5T tip its resemblance to the Oppo phone. It is worth noting here that OnePlus and Oppo have an internal relation through BBK Electronics, the parent group of both the smartphone vendors. The basis of the speculation, beyond the resemblance derived from the leaks, is that the OnePlus 5 launched earlier this year was nearly identical to the Oppo R11. The OnePlus offering was 0.5mm thicker thought, probably thanks to its higher-end chipset. 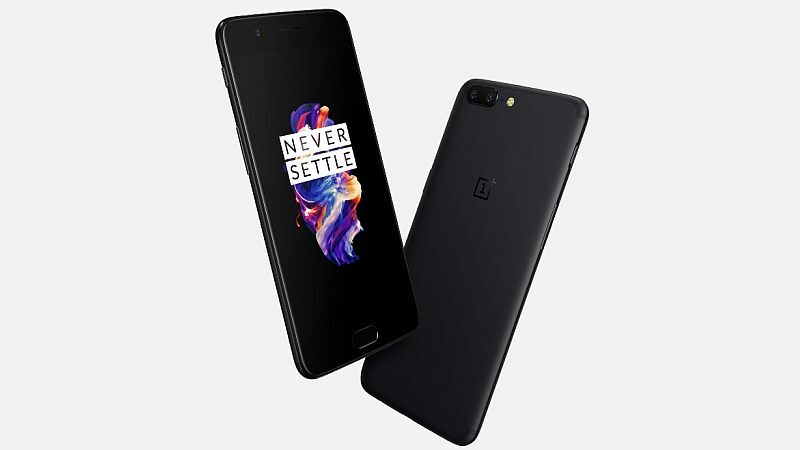 While specifications of the OnePlus 5T are yet to be confirmed by the company, a listing on GFXBench, as reported by technology blog TechieState, reveals a 6.01-inch display with a 1080x2160 pixels resolution (an 18:9 aspect ratio). The listing also suggests that the smartphone has a 20-megapixel front camera sensor. However, it contrasts the previously leaked AnTuTu listing that indicated out of the box Android Oreo support and 20-megapixel rear camera sensor. Considering the "T" version of the previously launched OnePlus 5 (review), the OnePlus 5T is not likely to be a completely new model. The smartphone is expected to be powered by the same Snapdragon 835 SoC that was debuted on the original OnePlus flagship. Likewise, it would continue the trend of sporting a dual-camera setup. Nevertheless, some recent rumours claimed that the OnePlus 5T would come with a bezel-less screenand have a rear-facing fingerprint sensor. It would have some software-level tweaks, too - through a new OxygenOS version.